We can trace a garment back to its source through textile fabrics, threads and embellishments. How, when and where was it produced? Who by? For what purpose? Material analysis opens up a world of historical data which, combined with an understanding of shape, style and mode of construction, can inform the viewer of the object’s wider socio-historical context. More often than not, fibres can be identified speculatively by eye; the fine shine of silk is very different to the rough, fibrous, matte texture of wool (although looks can be deceiving). Visual and textural material observations, coupled with a little prior knowledge of dress and textile history, can offer fairly conclusive evidence of what an object has been made from and how it has been constructed. Once identified, fibres can be compared against trade routes, agricultural output, advancements in construction technology and so forth, to place them into their wider context. There is no substitute for a close look at a textile with a magnifying glass to really deconstruct the artifact. 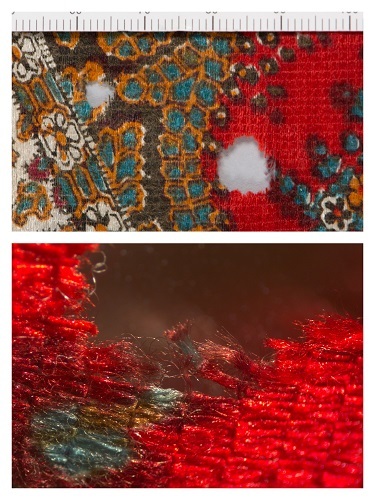 For a textile conservator, material identification performs a vital additional role in object analysis; it aids in decoding why and how a textile has degraded and allows us to predict and pre-empt further deterioration in the future. When proposing a conservation treatment material speculation is not an option. For example, a seemingly innocuous solvent such as acetone (nail polish remover), commonly used to remove stains from historic textiles, becomes a destructive liquid force when applied to the synthetic fibre acetate. This will burn through the textile in a matter of seconds leaving vicious holes – not a mistake you want to make on your twenty-first century museum example. Knowledge of fibre type may also inform preventive conservation strategies as once a material has been identified we can propose an ideal storage environment for its future preservation. Synthetic fibres, composite threads or combination weaves can be more complicated to identify by eye, particularly as we move into twentieth century textiles. Before starting a conservation treatment I will often take a sample from the historic textile and view it under a light microscope to validate my hypothesis; a useful method for differentiating between natural fibres. There is nothing quite as satisfying as seeing the signature twist of a cotton fibre or scaly exterior of wool appear under the lens to authenticate an initial visual textile assessment. In this manner it is also possible to identify textile coatings and finishes such as delustrants on silk (usually titanium dioxide applied to reduce the shine), which may appear as black speckles on the surface of the fibre. Experiments with fibre cross-sections can yield equally pleasing results, particularly for synthetic fibres. Synthetics tend to appear uniformly straight and featureless as longitudinal samples yet have their own characteristic form when sliced horizontally. Their shape gives the synthetic fibre its specific properties and therefore a cross-section can help to separate a viscose rayon from a polyester or an acrylic. Microscopic fibre analysis can sometimes be frustrating, requiring a certain amount dexterity with a scalpel, and usually one or two failed attempts yielding fuzzy cross-sections. It is, however, not expensive, requiring few resources and, when the image is clear it can offer a fantastically unique insight into a historic object; a distinctive fibre fingerprint indicating natural fibre growth or chemical manufacture. The attached images are a selection of my own recently taken microscopic photographs accompanied by the historic object from which they were taken. I hope you enjoy! BIBLIOGRAPHY/FURTHER READING: (1) Emery, Irene. The Primary Structure of Fabrics: An Illustrated Classification. Textile Museum, 1966. (2) Fiber Reference Image Library. https://fril.osu.edu/. Accessed April 19, 2015. (3) The Textile Institute, Identification of Textile Materials (Seventh Edition), 1967. Glasgow Shawl © Jamie Robinson, Centre for Textile Conservation. 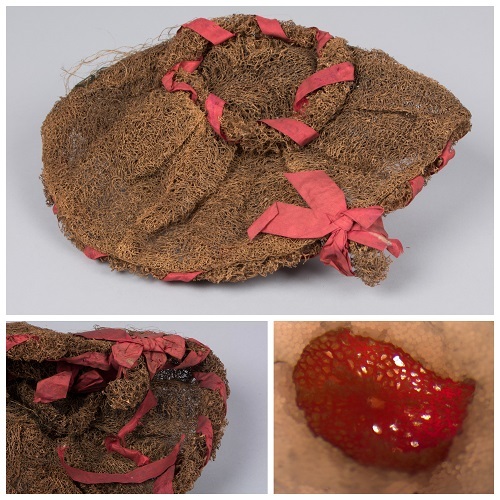 Loofah Hat, Image Reproduced Courtesy of Glasgow Museums. 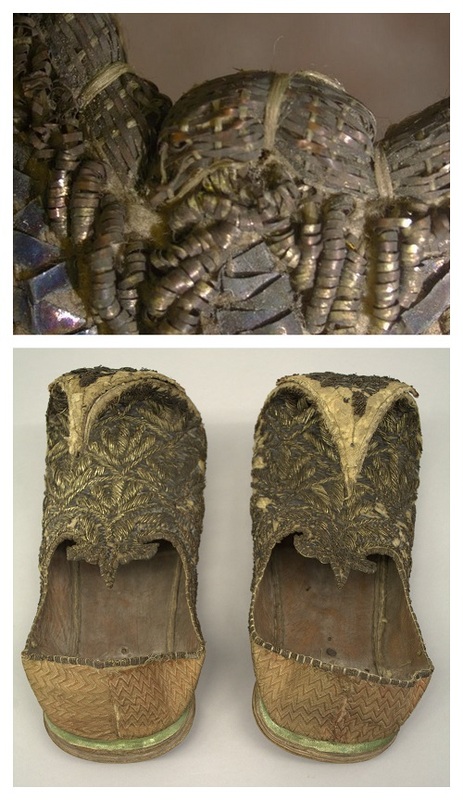 Embellished Leather Slippers (Stereomicroscope), Reproduced Courtesy of The Hunterian Museum, Glasgow. 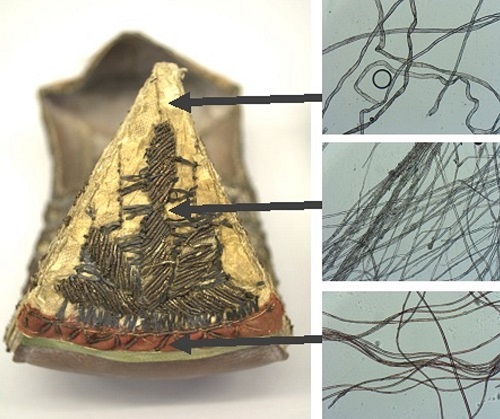 Embellished Leather Slippers (Light Microscope), Reproduced Courtesy of The Hunterian Museum, Glasgow.